Today sees the announcement of the first Higher Education Bioscience Technician of the Year Award. 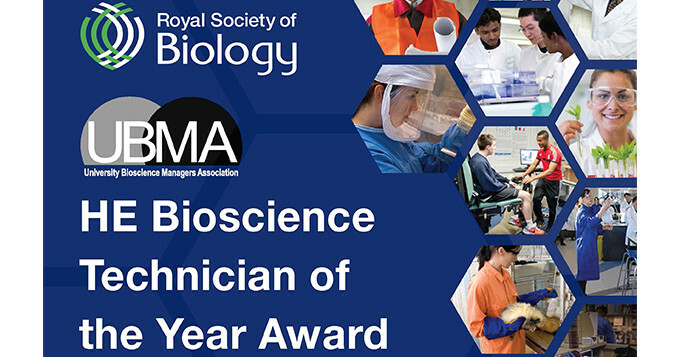 This award has been developed jointly by the Royal Society of Biology and the University Bioscience Managers Association (UBMA) and is open to all Technical Staff working in Higher Education in the UK and Ireland. The Higher Education Bioscience Technician of the Year Award seeks to recognise the superb work of technical staff working at any level within Higher Education, which underpins bioscience research and teaching in universities and Institutes of Higher Education across the UK and Ireland. Applying for the award is really easy and simple, just follow the link to the Application Form and complete basic details about yourself and your career. You can either nominate yourself or get someone in your Department/School to nominate you. Instructional sign off is then needed and this can be by electronic signature to ensure that the information is accurate and correct. Applications should be submitted by Thursday 30th November 2017 and shortlisted candidates will be asked to submit an up to date CV. An invitation to attend the 2018 UMBA annual conference and award ceremony which is being held at Imperial College London. The runner up will receive the same registrations and recognition together with a £200.00 monetary prize. The Higher Education Bioscience Technician of the Year Award is a fantastic opportunity to promote the valuable work of Technical Staff working in Higher Education. Further information about the Higher Education Bioscience Technician of the Year Award can be found by following the link below.